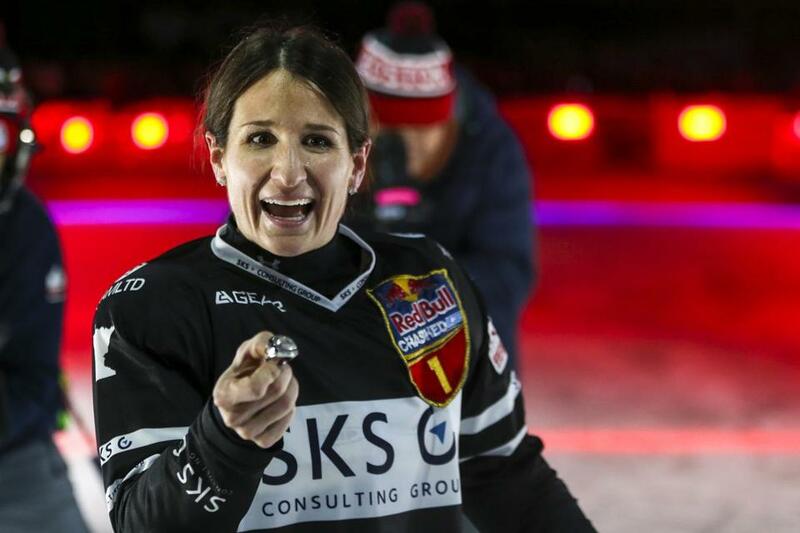 Amanda Trunzo shows off her championship ring after winning the women&apos;s finals of the Red Bull Crashed Ice event at Fenway Park. The latest winter sport to stop by Fenway Park culminated on Saturday night with bright lights, cold winds, and fireworks both on and off the ice. 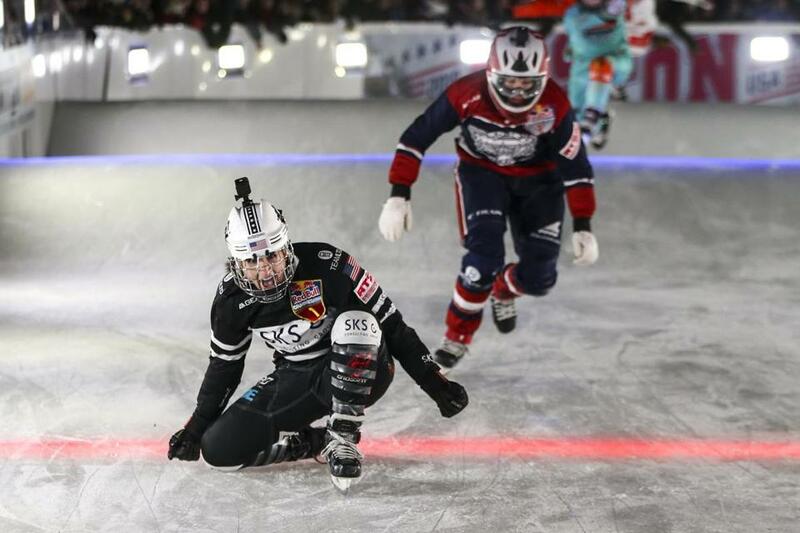 Red Bull Crashed Ice, showcasing the relatively new sport of ice cross downhill, featured races of four skaters at a time winding their way through a narrow 1,200-foot ice course that started on top of a seven-story structure built specifically for the event in right field. It marked the first time an ice cross downhill event had been held inside a stadium. Cameron Naasz crosses the finish line to win the men's finals. The two-day schedule of races produced a livelier crowd on Saturday, though Red Bull didn’t release an official attendance figure. Fans shrugged off the wind chill to come out and catch a glimpse of a sport many were unfamiliar with. Fireworks and an elaborate lighting system highlighted the already captivating sight of a full-length ice course inside Fenway, and freestyle riders — including one skater dressed in full hockey goaltender pads — offered amusing runs through the course in between races. The women’s final belonged to former Dartmouth College hockey player Amanda Trunzo. The American, who won earlier in the season in Red Bull’s Japan and Finland events, made the technical descent look easy. Canadian Myriam Trépanier finished second, while American Tamara Meuwissen was third. In the men’s final, Naasz, an American who’s become a star in the sport, held off Austrian Luca Dallago for a comfortable win. Canada’s Scott Croxall finished third. With the win, Naasz jumped from fourth into first in the World Championship standings. He leads Croxall by 100 points with three races remaining in the season, hoping to add a third championship to his resume. 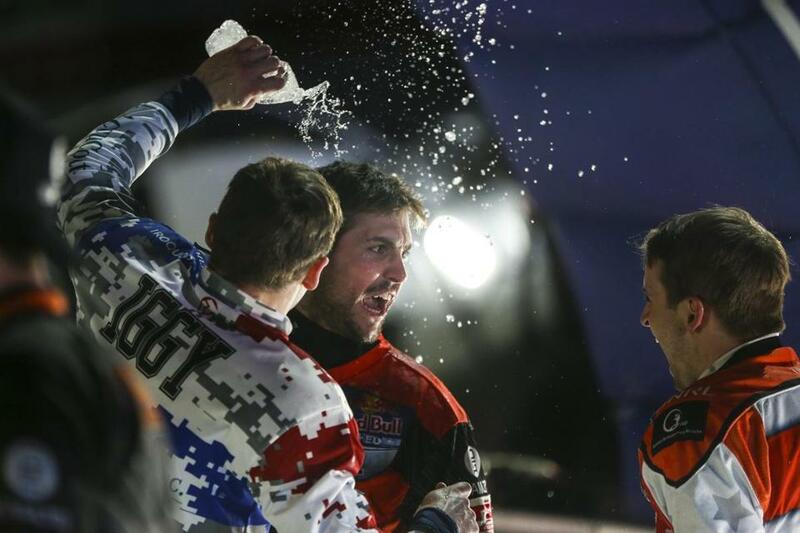 Mike Iulianello pours water on Cameron Naasz after Naasz won the men's title. During Saturday’s early heats, several of the favorites, including Naasz and Trunzo, advanced with ease. One exception came in the men’s round of 32, when Croxall, the overall ice cross downhill points leader, failed to overcome an early setback, and was eliminated. Finland’s Mirko Lahti, second overall in the men’s standings coming into Boston, also failed to make it to the later stages after a fourth-place finish in his quarterfinal heat. After Frozen Fenway hockey, and 2016’s big air event, ice cross downhill marked another chapter of winter sports hosted in the home of the Red Sox. 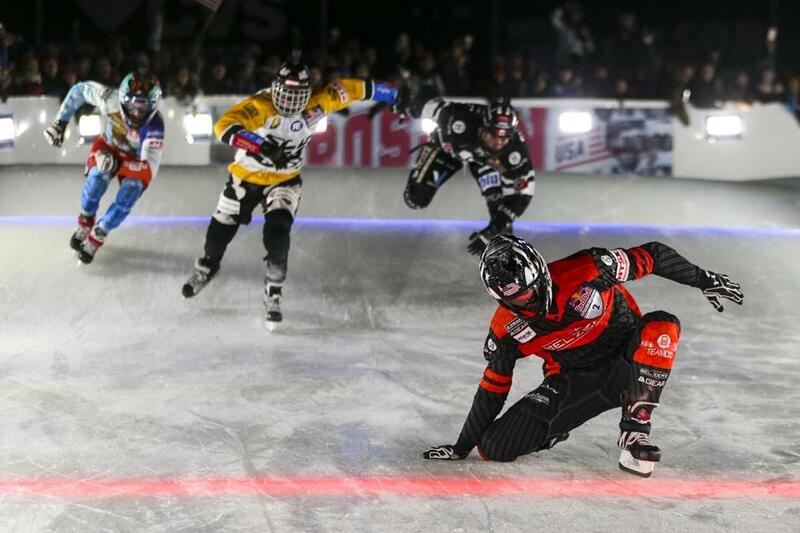 It was also a new thrill for Crashed Ice. Women’s champion Amanda Trunzo crosses the finish line. Hayden Bird can be reached at hayden.bird@globe.com. Follow him on twitter at @haydenhbird.